Floyd and Cecil Whitley founded the Texas Carnival Glass Collectors Club. They supported all other Clubs as well, and accommodated our invitation to present a marvelous banquet program for one of our early San Diego/Southern CA Conventions in the late 1980s. Cecil published a book on tumbler collecting and never hesitated to say that she probably was the only author known who lost money on every copy sold. That did not prevent her continuing accumulation of many rare tumbler examples and we have displayed some which sold at a St. Louis Seeck Auction in October 2010, following her passing in early August 2010. Cecil was a lovely lady; always ready to help promote “our glass” at a moment’s notice. We hold her in sincere memories and know that is the thought of all those who knew her. Left - CHAIN & STARS - Mgld. (Fostoria-clear) - Sold for $160. Right - Dugan DAHLIA VT.- (Dahlia is smaller) - Purple - 2 known - Sold for $450. Left - Diamond HARVEST FLOWER - Purple - Sold for $350. Right - Northwood NEARCUT - Purple - Sold for $800. Left - Northwood PLUMS & CHERRIES - Blue - Only Tumbler known. 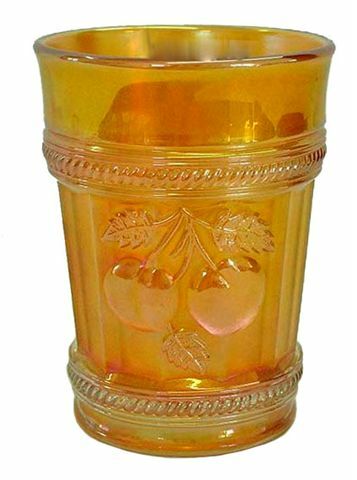 Right - Northwood PLUMS & CHERRIES Tumbler. (Opposite Side) - Sold for $3000. Left - Northwood PEACH - Marigold - Sold for $2100. Right - Dugan S-REPEAT - Marigold - Sold for $725. Left - Northwood WATERLILY & CATTAILS - (E.Robbins 1914) etching.- Blue - Sold for $1300. Right - Northwood WATERLILY & CATTAILS - 1 of 2-3 known - Purple - Sold for $200. Left - Heisey WIGWAM - Sold for $275. 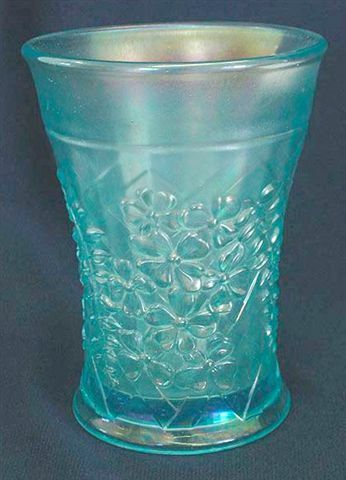 Right - Northwood IB WISTERIA Tumbler - Sold for $750. CHAIN and STAR: The pattern is repeated on two sides. It has a 2 ½” diameter ground base. Produced by Fostoria in clear crystal, it was their #1467 Virginia. Only a handful of these are known, and appear to be of the “after-market marigold” finish; perhaps the Marlin, TX Mineral Treatment? DAHLIA Variant: A close look at this tumbler reveals a Dahlia which is smaller in size than those which appear pm the Dugan water sets. One revealing factor: old tumblers have a 33 rayed star on the underside of the base. Reproductions by L.G. Wright and Mosser have plain bases. Two of these purple variant tumblers are known. HARVEST FLOWER: Rare as they are, complete water sets are known in marigold, but only a handful of amethyst tumblers exist in this Diamond Glass design. 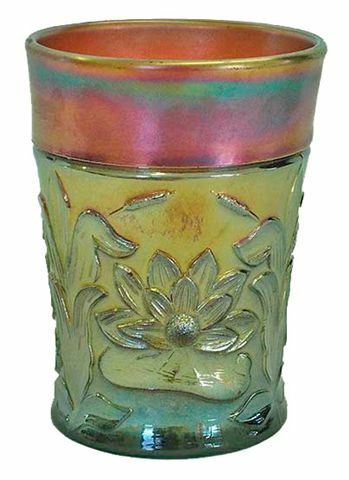 There is a single tumbler in pastel green, with marigold iridescent overlay, but no matching pitcher. The design appears in no early wholesale catalogs, but based on mold characteristics, the pattern has been attributed to Diamond, rather than Dugan. NEARCUT: This Northwood pattern is extremely limited. The Nearcut goblet in amethyst is extremely scarce. 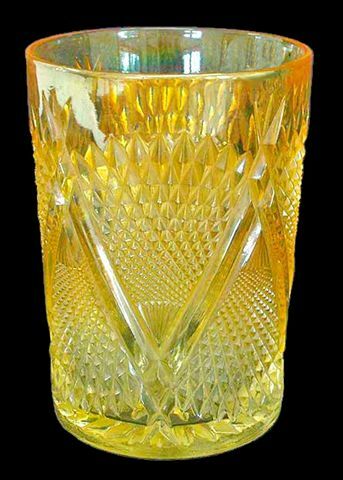 There was extensive production in crystal, but marigold water sets are quite rare, and this amethyst tumbler could well be one of fewer than half dozen known. We have never known of an amethyst pitcher. PLUMS & CHERRIES: Seems that only three examples are known in this pattern: a covered sugar-minus lid in amethyst, a cobalt blue spooner, and this tumbler in cobalt blue. Carl Burns notes that the design appears most often in non-iridized, color stained crystal to include a berry set, table set, water set, and a large covered serving bowl. All known examples bear the Northwood trademark. Color stained crystal dates to 1907-1909. Northwood carnival dates to 1911-1912, so the limited production of this pattern likely is from that period. One side of the tumbler offers a spray of cherries, identical to those found on the Cherry & Cable pattern. The other side displays two plums. Cecil was very proud of this tumbler. PEACH: Just a handful of these Northwood marigold tumblers are known, but no matching pitcher has presented itself! Water sets in the pattern are known in cobalt blue and white. 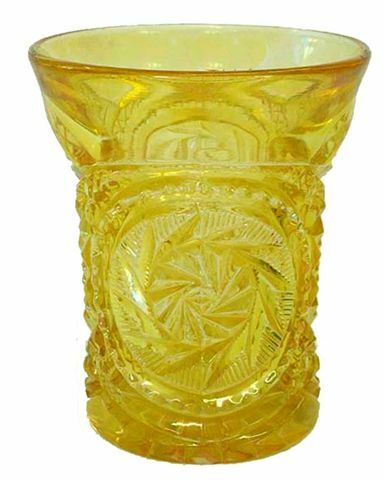 S REPEAT: Only a handful of these Dugan tumblers are known and they are all marigold. The original name for this design was National. It was first introduced in non-iridized form when the Indiana plant was still under ownership of the National Glass Combine. A limited number of shapes are found in carnival glass: punch bowl & base, punch cup, whimsey creamer, covered sugar, and toothpick holder in amethyst, a punch bowl only in iridized crystal and the marigold tumblers. 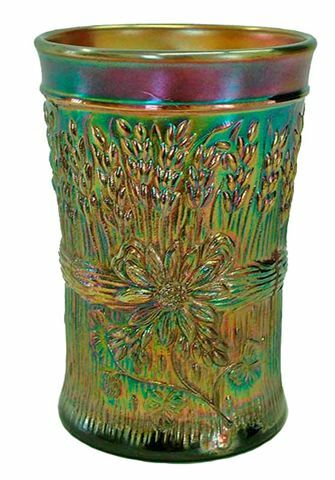 WATERLILY & CATTAILS: This cobalt blue tumbler with the etching comes from Northwood production. Carl Burns noted there are about 6 known to exist and the date 1909 is also exhibited in some cases. 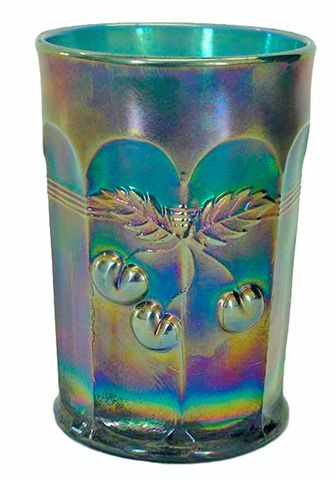 One of these etched tumblers sold for $1700 in (2000). 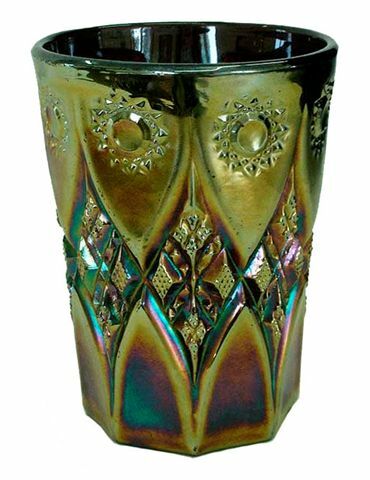 The purple tumbler is extremely rare and must have be an experimental color. 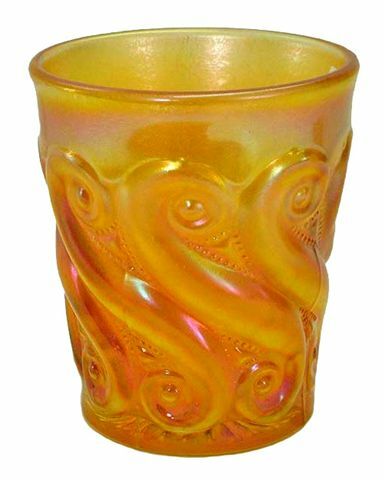 The Fenton tumbler offers a distinct basketweave design around the base of the pattern area. The Northwood tumbler lacks this. Northwood water sets in marigold and cobalt blue are the extent of shapes known in this pattern. The pitcher is tapered and quite different from the Fenton pitcher. 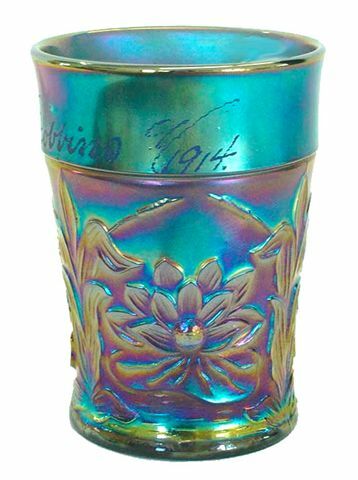 This design is the first full line pattern used in iridescent production in 1908. The Fenton version of Waterlily & Cattails was utilized in 1907 for production of Chocolate Glass and Opalescent Glass. 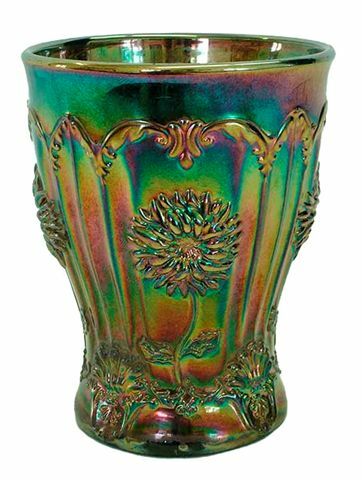 In 1908 the first of the Marigold iridized pieces appeared on the market, leading the way into a very successful era we all appreciate! WIGWAM: This is a Heisey pattern, which was produced in crystal. The three “marigold” examples known have some base damage and have sold in the $200-$300 range over the years. Seems likely that since Heisey did not iridize, their slightly damaged tumblers were sold, on occasion, to after-market iridizers. Here is another item in the Oct. 2010 Whitley auction which appears to be the same color as provided with the Marlin, TX Mineral Bath treatment. WISTERIA: Look no further, if you have wondered which of the Northwood patterns is considered rarest of all. Wisteria dates from the 1912-1914 time period and is mould-blown with applied handle. Complete water sets are known in white and ice blue. There are also tumblers in ice green and lime green. 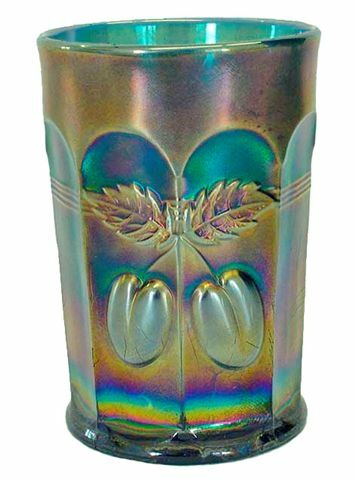 A whimsey vase having a flared-ruffled top in green surfaced in 1991 at an antique auction in Ohio, along with a white whimsey bank fashioned from a tumbler, with top pinched in to accommodate coins, completes the offerings in the pattern. But know this, that in the last days perilous times will come; times of stress. For men will be lovers of themselves, lovers of money, boasters, proud, blasphemers, disobedient to parents, unthankful, unholy, unloving, unforgiving, slanderers, without self-control, brutal, despisers of good, traitors, headstrong, haughty, lovers of pleasure rather than lovers of God, having a form of godliness but denying its power. And from such people turn away! For of this sort are those who creep into households and make captives of gullible women loaded down with sins, led away by various lusts, always learning and never able to come to the knowledge of the truth.